Our great piano teacher moved away this summer. We all felt pretty awful about it, because we loved her and my girls were making such progress. But we found a new lady who seemed great over the phone, and at the end of the whole summer hoopla, that first Saturday after the first few days of school, we loaded up and headed to her house. The older girls were fine with the adjustment. But as is becoming more and more common with Lucy, that first piano lesson was a rocky one for her. She wasn’t emotionally prepared and I kicked myself that I hadn’t talked through everything with her before we left. I know better. It’s always difficult to know how much to tell teachers about Lucy. I want them to know what they’re dealing with, but I also want, in a way, to act like everything is normal. I don't want them to start with a negative impression of tough stuff that may come along with BBS. I don't want to set Lucy up to fail. It's an interesting balance. I had warned this teacher that she is losing her vision and is sometimes emotional, and sure enough, within minutes Lucy had huge crocodile tears rolling down her cheeks. When this happens her glasses get all fogged up and she has to lift them up to the top of her head over and over again while she wipes away all those plump tears spilling out. And my heart just broke because I know her well, and at this point there is no turning back. It’s downhill until we can talk through things after she’s calmed down. The teacher realized she really couldn’t see the notes very well, so she whipped up her own larger sheet music with a Sharpie marker. Now Lucy could SEE the music, but she was confused with no measures and notes quickly scribbled on the paper. She likes to count (unlike any other child I have seen) and she didn’t know how to count those uneven measures and she fell apart more and more by the minute. On the outside I’m sure I looked fine, composed, trying to console, but on the inside there were parts of me just breaking up into pieces. I want her to see. I don’t want to search for large-note sheet music and have piano practicing turn into something horrible. I know this sounds whiney and complaining, but oh how I just want her to continue on her happy little road of counting those measures with her sing-songy voice and loving to practice. I wasn't ready for that stage to evaporate! I took it so for granted that she could see well enough to learn what she had learned so far! I should know better than to take anything for granted these days. The things she can do are narrowing down so quickly it seems. Please don’t take away piano too! We went home and I was determined to get to the bottom of why things went so awry. True, the new piano teacher's home is a little dark and Lucy's used to sitting at the piano here with a whole wall of windows to light her way. But could she even see the notes here? Was she just memorizing things?We sat down at the piano and I gave her my own new lesson. And she did it. With confidence. But I realized that her confidence was more from us going over the notes over and over again, telling her which ones went up and which ones went down. She has to stand up close to the music to really tell what those patterns are. But still, I gave her a new lesson. And her sing-songy counting voice came back along with the smile on her face. A few days later, after I had calmed my heart a little, I called the piano teacher and went over all my thoughts. And she shared hers as well. We had a great conversation and she is really up for the task, wanting to take on writing up larger sheet-music for Lucy and figuring out her sometimes-moodiness. And so far, it's going pretty great. She is back to confident practicing and that task oriented little girl of mine loves to mark off that spot for practicing on her job chart once again. It makes me so grateful all over again for the good people in her life who are willing to bend over backwards to help her and love her and watch her bloom. But I'm still on the look-out for larger sheet music and there's an extra chink in my heart sorrowing that vision she uses so much is slipping out of both our grasps more quickly than we're ready. Thank you! I googled and couldn't find something like this so I appreciate it! I am so grateful that you have people that love and encourage your daughter and want to help her. My mother heart hurts for you... I know there is a reason for all but that doesn't make it any easier. This is a beautiful post and touched my heart in a personal way. I could feel for your daughter just as the similar such experiences I have had with my children who have special circumstances. It breaks your heart and yet it makes your heart warm to find good people in the world who are willing to go the extra mile it sometimes takes. - Reach out to Lucy's teacher of the visually impaired. She will have suggestions, especially as she knows the font size Lucy needs and the strategies that work best for Lucy. Also, ask the TVI to speak with the piano teacher directly. We love to help our students and are often willing to take a few minutes to talk with extracurricular instructors for our students. -Large print sheet music is an option and someone posted a link above. I would encourage the piano teacher to either use large print music, or to find out the font size Lucy uses and enlarge music to this size. Much easier and visually better than writing it out. - quickly move to memorizing the piece of music- which most performers do, too. -download a recording of the piece of music she is learning so she can internalize the tempo, melody and dynamics. The piano teacher can record herself playing it. Options for enlarging music and presenting it in high contrast mode. - there are options if Lucy loses more vision. Playing by ear, and learning braille music code (challenging, but worth it for serious advanced musicians who are proficient in Braille). It seems Lucy's vision has been changing more lately, and this is, obviously, difficult. I would encourage you and Lucy to meet other children who are successful Braille readers. While it would be great if they had the same eye condition, that isn't necessary. I've found my students LOVE meeting role models who are visually impaired (kids and adults). Parents have also shared how helpful it is to meet adults who are successful and independent, and to talk with families who have similar experiences, but are a little further ahead on the journey. These experiences offer hope for a future that can be fulfilling and full of opportunity for those with visual impairments. Oh gosh, I cannot tell you how much all these ideas mean to me. So much to think about, and so much I haven't thought about that I want to act on right away. Thank you thank you thank you with all my heart for taking the time out to write this for me. What a thoughtful response! Providing Lucy with role models who are visually impaired seems like it could be very powerful. I hope this might provide some comfort. My music teacher in elementary school was blind. She had an assistant who helped with paperwork and managing the class, but she could play the piano beautifully as well as the guitar, recorder, flute, and probably a few other instruments. She accompanied us for each of our school performances on the piano. I believe she lost her sight when she was 8 or 9 years old. Thank you for sharing this. It is so comforting to think of others with visual impairments who have done so much. I know there is so much hope and light, but sometimes it's easy to lose track. So thanks for this. Does she want to the play the piano? Does she want to play another instrument? Why must she learn new music by using her sight? Perhaps she should be just be practicing songs she already knows? Perhaps she should learn new music without using sheet music, by ear? You are trying to get her to conform to your world instead of you conforming to her world. 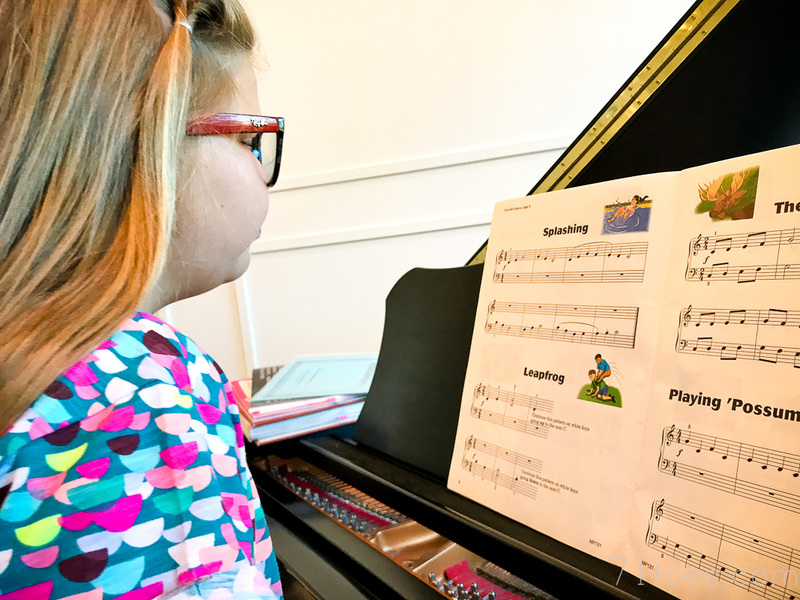 If she can play music without needing the sheet music she won't lose her current piano skill after she loses her vision. There will be a point when the sheet music can't get any larger. Don't make the piano/instrument of her choice dependent on her vision. It's not fair she is losing her vision. So many adults manage most their life without anything as challenging as what your little girl has been managing for quite some time. It's not fair that kids are confronted with the unfairness of life. Yes, she loves the piano. I know there are great resources to help her progress in other ways without her sight (love all that has been shared in these comments! ), but I'd sure love for her to make as much progress as she can while she has her sight. She's still a beginner but whatever she learns now will be such a great building block for the future. My algebra teacher in high school was blind. He had an assistant who would write the demonstrations on the board, but he taught the class, and he walked the rows, and he answered our questions. His assistant was our last resort for help. He was the best math teacher I ever had! I love all the information Annie provided. Sometimes this internet world is so awesome! Yes the internet is awesome. And thank you for sharing that about your algebra teacher. Gives me so much hope! This sounds so so picky. But crocodile tears doesn't refer to the size of the drops, but the motivation behind them. " ... are a false, insincere display of emotion such as a hypocrite crying fake tears of grief." So when you describe Lucy's tears that way it changes the tone of the piece and how the reader sees her. As I read on I understood her frustration. Acknowledging and accommodating a decrease in a sense is frustrating. But is not an embarrassment. It is a reality. You have great support for her. Let them build the guide rails that will lead to independence. We all do things in our own ways. We all have strengths and weaknesses. She will shine her own light, in her own way. Office Max might can make enlarged copies for you. I've made copies of entries books almost and they will even spiral bound them for you. If you take her practice book to them and tell them what you need, they might be able to help. I work for an OT and we often work with client with low or no vision and supply them with aids to complete routine tasks. You might consider something like this to help Lucy read the small print on the music. She's such a sweetie, blessed with a loving and supportive family. Have you heard of Hoffman Academy? It's YouTube videos of piano lessons and totally free. I don't know how accommodating they would be for Lucy, but they are really, really great for beginners. Sigma Alpha Iota, a women's music fraternity, has several projects that help blind and low-vision musicians. Check out the link below and contact the project director to see how they can help. There is also a list of resources that could be of help. Hi Shawni, I am a long time reader and would love to share a memory with you. I am a professional French horn player. Back in high school, we had auditions for the All-State Band. It was very exciting and very difficult to make that band, and even more difficult to get a top spot. But my Junior year, I managed to accomplish this. I practiced that music so much and cried over its difficulty that when I finally arrived at the first rehearsal, I was nervous but felt ready. I sat in the 2nd chair spot. Next to me was a girl sharing the 1st chair spot. She stared straight ahead and I soon realized she couldn't see. I was very interested as to how this would play out. How could she possibly keep up with the instructions of the conductor? How could she play "with" the time? How could she remember all the notes and rests of 5 different very difficult pieces- an hour's worth of music? And even more so, my young mind worried, "Will she sound good enough?" Well....she was simply amazing. She had indeed memorized every note and rest. She indeed followed and remembered the conductor's every instruction better than all of us could. And she did indeed play "with "everyone perfectly. When I first noticed her, I thought she had been allowed to sit at the "top" as a courtesy, but no, she had absolutely earned that spot and it blew me away. I returned to that stage my Senior year and there she was again and just as impressive. How wonderful! I'm saddened I was much too shy to say a whole lot to her, and my heart still aches for the rehearsal breaks where she sat on stage while we all mingled as she waited for her father to lead her on and off. After that I went on to earn music degrees and teach French horn for 20 years. I have mentioned that wonderful girl to each student and each colleague along the way. She had boldly done every bit of work to fully enjoy her experience and contribute to music making, and she was truly a talent (even if she had had her sight). She will never know how many young musicians have heard her story and been inspired. There may not have been light in her eyes, but there was a light in her very being that has certainly spread far and wide. Your Lucy is already so obviously full of that light. Shine on, Lucy!!! The other is a postcard that talks about the BARD mobile app, which is a free web-based service that "provides access to thousands of braille and talking books, magazines, and music scores." The other side of that postcard talks about an app that can scan U.S. currency and announces its value to the user. Lucy is too young to need it, but I thought I would pass it along because I think it's awesome that technology has come so far and is so helpful! I don't know anything about these programs outside of the literature I grabbed today, but I hope it might send you in a direction that is helpful. As long as you own the music, it is legal to make photocopies for your own personal use. So she can play any music she wants if you can photocopy and enlarge it. Also, when I was at ASU about 10 years ago, there were a couple of piano performance students who were visually impaired. One I think was blind, and the other had severe tunnel vision. I think both had Dr. Cosand as their teacher, but am not sure. I have no idea how they learned their music, but they played beautifully.